I'm "blaming" my friend, Meredith Carney, for a spur-of-the moment purchase at the beginning of the month. In case you don't know, the movie "Despicable Me 3" is now in movie theaters. The minions are back and with them, product tie-ins, of course. She was shopping at Wal*Mart, a place I won't go, and sent me photos of some minion clothing. "Hmmmm," thinks I. 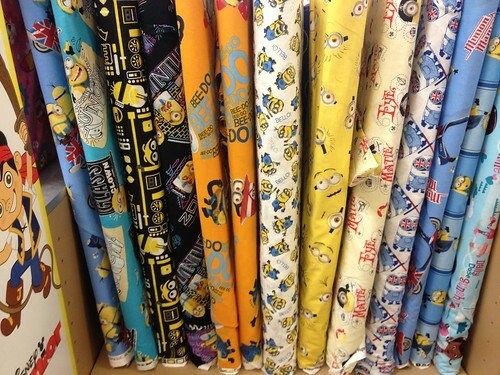 "Is there minion fabric?" Well duh. JoAnn Fabrics might have just a few choices. There are also some prints available online only, but I need to see the fabric to decide what print to get and then, what to make of said print. Yes, yes. I know what's going through your head. We will not talk about the boxes of fabric in the closet. We will agree to just nod in that general direction. Look! Minions! I did not have to go to JoAnn Fabrics for anything. I went because of minions and Meredith showing me clothing at Wal*Mart. What's the aphorism? "I can resist anything except temptation"? I came home with these. The Disney World trip is less than 100 days away now. I was going to do something crazy and make capes for all the guild members, and family members, attending the event. But, about April, I realized I'd bitten off way more than I could chew so I abandoned that before I spent $$$ on fabric I won't get fashioned into things. But I could get a shirt done before October. I opted to buy a new pattern. I usually don't buy Vogue patterns because they assume you are more than an intermediate sewer, but I like this one and it's fairly simple. I'm going to make the shirt at the lower right corner. It's two fabrics. I will make a mostly yellow with a white block and then a mostly white with a yellow block. The shirt has a 9 inch zipper in the front to facilitate putting it on. It's stitched in the "invisible zipper" style, something I haven't done in a very long time. We'll see. Since this is a strictly humorous shirt, I don't, necessarily, care if it's visible or invisible. The zipper is not the point of the shirt. I get these home and feel the desire to sew rising. In order to do that, I had to clear a path to the ironing board and deal with the stuff I had stacked on the ironing board. Then, I've spent the last week clearing off the kitchen table. I'm so bad about just dropping stuff there in the "I'll deal with it later" mode, and there it sits. The urge to just move stuff to another pile was strong, but I resisted and actually cleared off the table, putting things away, dealing with them. In the process of cleaning, I found the pieces to a lightweight jacket I was going to make last year, to wear to Carole's for my birthday. The jacket is not complicated. I cut out the pattern back in early October of last year. And then it sat. I got busy and just lost the desire to work on it, even with a self-imposed deadline. 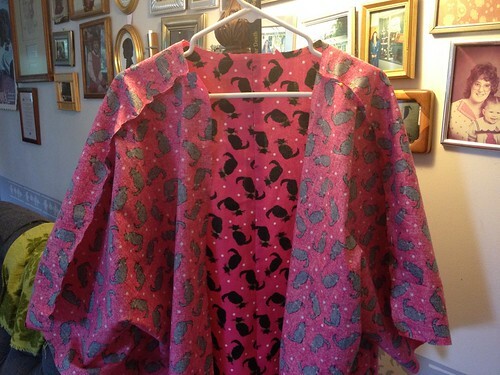 When the table was cleared and all the pieces liberated, I felt like I couldn't sew the two shirts without finishing this jacket. I didn't have, handy, thread matching the pink. I have, instead, a dark mauve-ish color which actually works better. One day's worth of sewing and viola. The next step is to prepare the trim. I'm using a black satin for the trim around the jacket and sleeves. I bought more interfacing for the shirts, which was a good thing because it appears I never cut interfacing for the trim. But I got to thinking. I haven't sewn satin in years and I have concerns about fusing interfacing to satin. Would the iron leave marks as I was fusing? Asking my seamstress friends, they said to use sew-in interfacing because satin will pucker with fusible. Hadn't thought about puckering. 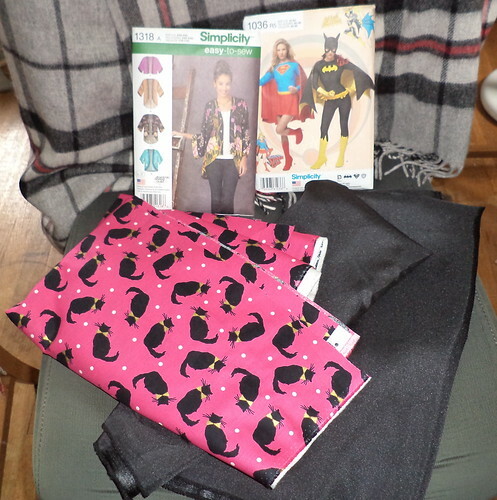 The next issue is, do I have enough non-fusible interfacing? 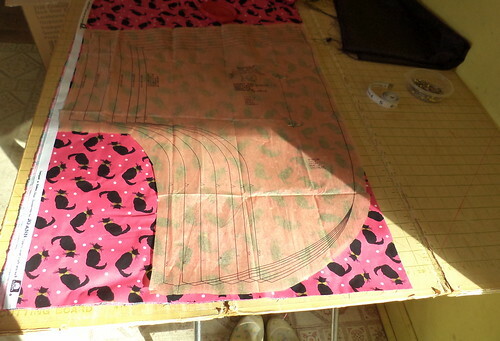 I haven't a clue, so I will have to find the box with the interfacing, and, tonight, take a look. At least there is still a sale at JoAnn's so if I need interfacing, it will be on sale. I don't use non-fusible if I can help it, but I know I have a stash, just how much is the question. So, here we go. 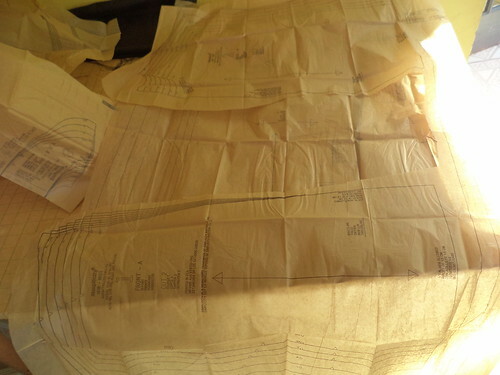 Once the interfacing issue is resolved, this will go together very quickly. 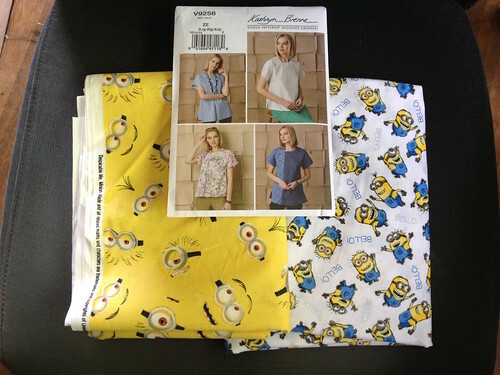 Then I can work on the minion shirts. Sewing makes me feel good. Finishing projects makes me feel double good. It's win/win. 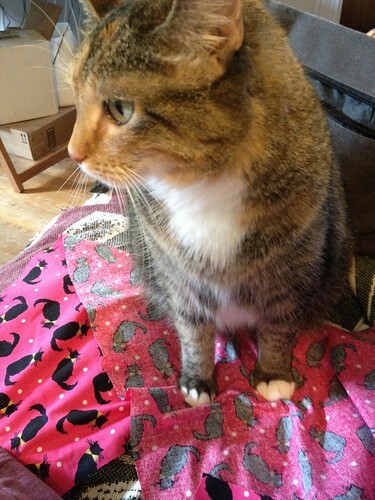 And, my "helper" likes to supervise when I sit in the recliner as I pin seams.